Good Afternoon! One week from today it will, once again, be matchday @The Cathedral of Football. RBNY concluded the pre-season with several games in Arizona, against local, MLS and Mexican opposition, with mixed results. With the looming home opener, against the powerhouse Seattle Sounders, there are several questions still to be answered. While we wait for those answers, let's get to some news from the past week. The photo above was taken yesterday. It seems that the beautiful grass surface from last year didn't survive several feet of snow and had to be replaced. Let's hope it takes root in the coming week. 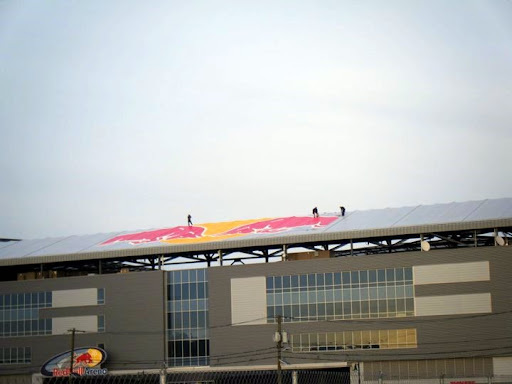 Also, the Cathedral's roof was given the Red Bull treatment this week, as was originally planned. Very nice! A couple of Roster moves were made official this week, as trialists Teemu Tainio and Stephen Keel have been officially signed. Tainio most recently played with Ajax Amsterdam and Keel is a former Colorado Rapids defender. Speaking of RBNY trialists: Trinidad & Tobago International Hughton Hector, who was part of the W Connection team that dismantled the Red Bulls in 2009 Concacaf Champions League qualifying, was in training camp this past week. Red Bulls Head Coach Hans Backe has extended his initial two year contract by another year. He'll be at the helm through the 2012 season. Mr. Backe has, apparently, also changed his mind about signing a #10 Creative Midfielder. He will, instead, look to sign another forward. I knew it was too good to be true. Fitness & Pace or bust, I guess. Red Bulls Right Back Chris Albright underwent surgery this week to repair a meniscus tear. He will be out 4-6 weeks. The Red Bulls announced this past week that they have hired a Performance Analyst. I'm guessing this has to do with the recent MLS/Opta Partnership. I, for one, wasn't very excited about this but some believe this will lead to a much needed stats revolution. Yeah, Ok.
A few interesting RBNY season previews this week, including this one from ESPN, and this one, from FIFA Presidential Candidate Grant Wahl (who predicts the Red Bulls will come in 1st in the East). There is also this one from the always entertaining Paul Gardner. The always fascinating Thierry Henry gives us this interesting interview (on his brand spanking new Official Facebook Page), where he talks about (among other things) "being able to live normally" here. Yeah, Ok.
A few Red Bulls/MLS related items from the world of technology this week. First, MLS has finally released the Iphone/Ipad MLS "Matchday 2011" App, so you can "follow your team anywhere you go". Don't have an Iphone/Ipad, but have an Android phone instead? Dowload the same App for Android by Clicking Here. For users of the Firefox web browser (like me), the Red Bulls have this excellent browser theme just for you. 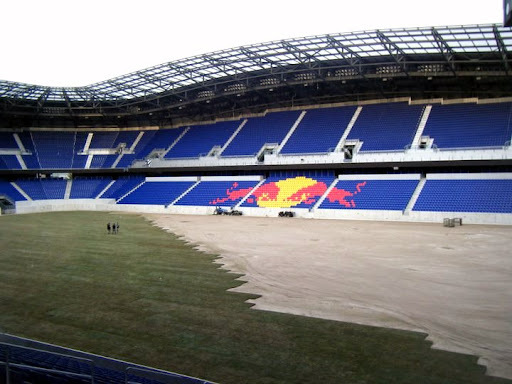 The Red Bulls have added El Zarco Tequila as a Red Bull Arena sponsor. Concacaf has announced the schedule for this Summer's Gold Cup. Red Bull Arena will host a First Round double header on Monday, June 13th, while a Quarter Finals double header will be played @New Meadowlands Stadium on Saturday, June 18th. 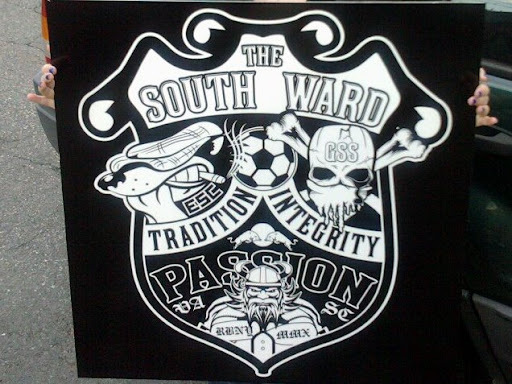 Some Supporter's Group happenings: The Empire Supporters Club will hold a membership drive today, Saturday March 12th @El Pastor, from 5-8pm. Also today, there will be a joint fundraiser to benefit the South Ward's Trip To Columbus @MMM Bello's, starting at 9pm. More cool stuff, like this, will be auctioned off at this one. Make it a point to stop by. Legendary former MetroStars goalkeeper, and current USMNT #1, Tim Howard wants you to team up with him for a good cause and, possibly, win a very cool prize. Finally, the President and CEO of AEG (the Galaxy's ownership group) Tim Leiweke has, apparently, let the proverbial "Cat-out-of-the-bag" in regards to the location of MLS Cup 2011. Get ready for another trip to La, La Land everyone!